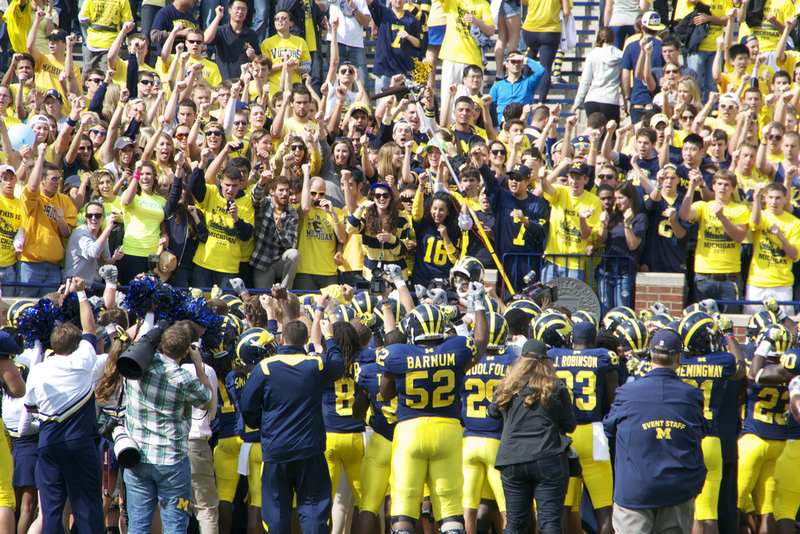 Players celebrate with the student section after 28-7 win over San Diego State. Funny how being 4-0 can feel so...unfulfilling? 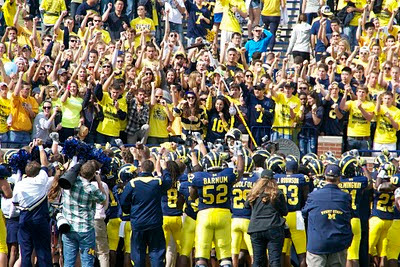 Yet, that is where we find ourselves as Michigan fans going into the 2011 conference schedule. For a third year in a row, we've gone undefeated against Notre Dame, and a list of relatively unassuming non-conference teams. This year beat a Notre Dame squad that we're still not quite sure how good they really are. We beat some directional Michigan schools with relative ease. And just this last week, Michigan took care of San Diego State...this year's version of UConn. All four wins are commendable, for sure. But even with a perfect start to the season, there are more questions about this Michigan team, mostly on offense, than before the season began. I've been trying to come up with ways in which to contrast the 2011 team from the previous two. Maybe Michigan was just able to schedule they're way into three straight undefeated non-conference records? It's not entirely out of the question. Dave Brandon has made no mystery that he's all in favor of scheduling "Baby Seal U" just as long is it means 110,000 people in the bowl every Saturday in September. It seems to be a trend in college football nowadays. So maybe we should just get used to undefeated non-conference schedules. In a few years (2017), we'll be down to three non-B1G games -- and who knows what the national conference landscape will look like by then? From the looks of things, Notre Dame could be off to the ACC. Or they could end up right here in the B1G. No one knows at this point. We'll save the argument that a cake-walk non-conference schedule really doesn't prepare you for the Big Ten for later. 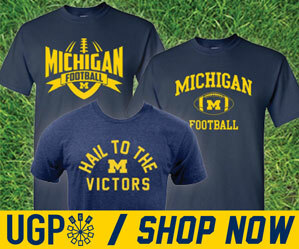 There is a lot of speculation about whether or not this Michigan team is the real deal or not. In years passed, a 4-0 Michigan team would be something to write about. That means we beat a great Notre Dame team, maybe a good Colorado, UCLA or Florida State team. But now, it's just another year. So when we get to the meat of the conference schedule, will things go better for us then in the last couple seasons? But the answer is not so simple. I like to think that there is another answer on this offense somewhere besides #16's legs. For all of the reasons I love watching Denard shred defenses each week, there are just as many reasons why I am so concerned about Michigan being so one-dimensional -- even when that one dimension is so great. From what I've seen so far this year, we really do want to get the ball to our running backs. We have the right guys in Vincent Smith, Fitz Toussaint, Stephen Hopkins (when he holds onto the ball), Michael Shaw...just to name the obvious. Our line is more than capable of getting those guys the room they need. It takes time for a new offense to gel, but we're getting there with the ground game. Those things are not the problem. The most apparent issue to most people is, Denard must establish his arm as a threat. Thus far, he's been struggling. Against San Diego State, it was non-existent. I think in practice, he's there. Borges must be seeing something he likes. But in games, you can just see that Denard is just not that comfortable yet dropping back and going down his progressions. He can do it, but it's not instinctual. Denard's most inherent instinct is to run -- and that instinct is very well honed. We get a pass this week with the 1-3 Gophers coming to town fresh off a loss to FCS North Dakota State. But things get much tougher after that with two road tests in Evanston and East Lansing. By the time we come home to host Purdue after the bye-week, we're going to know a whole lot more about this offense than we do after 4 games against questionable non-conference foes. By then, we should be just slightly closer to that answer before heading into the final stretch of the schedule.